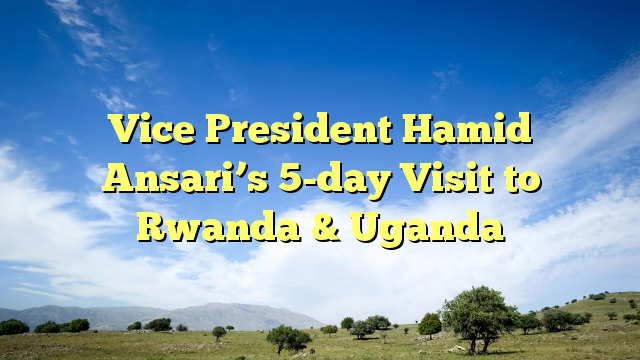 In News: Vice President (VP) had returned to India after concluding his five-day visit of Rwanda and Uganda. Rwanda (Capital. Kigali) and Uganda (Capital. Kampala) are both land-locked countries. The equator passes through the African countries of Gabon, Congo, the Democratic Republic of Congo (DRC), Uganda, Kenya and Somalia. It also passes through Lake Victoria. Rwanda, in east-central Africa, is surrounded by the DRC, Uganda, Tanzania, and Burundi. Uganda is bordered on the west by Congo, on the north by the Sudan, on the east by Kenya, and on the south by Tanzania and Rwanda. The highest point of Rwanda is Karisimbi, which peaks at 14,826 ft.
Lake Kivu making up most of Rwanda’s western border. Lake Kivu is one of the 20 deepest lakes in the world, and has a maximum depth of 1,575 ft.
Four of East Africa’s Great Lakes – Lake Victoria (second largest inland freshwater lake in the world), Lake Kyoga, Lake Albert, and Lake Edward lie within Uganda or on its borders. Relations between India and Uganda began in the 19th century when Indians were brought to construct the Mombasa–Kampala railway line. Ugandan independence activists were inspired by the Indian freedom struggle. India and Uganda established diplomatic relations in 1965. Each being a member of commonwealth maintains a High Commission in the other’s capital. The Indian High Commission in Kampala has concurrent accreditation to Burundi and Rwanda. Uganda hosts a large Indian community and Indo–Uganda relations cover a broad range of sectors including political, economic, commercial, cultural and scientific cooperation. Indo-Ugandan relations have been good since Uganda’s independence except during the regime of Idi Amin. Amin in 1972 expelled large number of Indian business community on the ground that they were exploiting native Ugandans. Since the mid-1980s when President Yoweri Museveni came to power, relations have steadily improved. Ethnic tensions are also the part of bilateral relations as Indians controlling the business and economy. Indians and persons of Indian origin are playing central role in economy of Uganda. Indian businesses are among the largest taxpayers in Uganda. Traditionally they are Gujarati descent (traders). Immigrants from Punjab and healthcare workers from Kerala have also arrived in Uganda in recent years. Since the 1980s, India has emerged as one of the largest investors and trading partners of Uganda. Government of India is setting-up a Food-Processing Business Incubation Centre (FPBIC) in Uganda. India is one of the top three FDI investors in Uganda. It is estimated that Indians/PIOs have invested more than USD 1 billion in the country during the last decade. Moreover, India’s engagement with Uganda has been consultative, response based and focused on developing Ugandan capacities and human capital. A bilateral arrangement for Joint Commission Meeting (JCM) at the Secretary level provides the framework for comprehensive discussions on all bilateral issues. An India-Africa Institute of Foreign Trade (IAIFT), (one of the 5 institutes offered by India at the Pan-African level under India-Africa Forum Summit (IAFS –I)), is being set-up in Uganda. IAIFT is to provide training in International Business, Management Studies, and entrepreneurial skills and promote research in foreign trade. India’s National Defence College (NDC) provides Training to the Ugandan defense officers. An Indian Military Training Team (IMTT) is stationed at the Ugandan Army’s Senior Command and Staff College since February 2010. IMTT provides training to the senior officers of armed forces of Uganda and other East African countries. This was the first high-level bilateral visit to Uganda from India since 1997 and first high-level visit to Rwanda ever. VP has emphasized that business ties with Uganda is a “key pillar” of the bilateral relationship. India and Uganda decided to expand cooperation in the field of energy sector and training of personnel for space programme and peaceful use of atomic energy. Uganda asking to setup automobiles manufacture unit locally to discourage import of cars. However Rwanda got independence from Belgium in 1962, but due to continuous state of civil war in Rwanda, bilateral relation between two countries could not get firmed up earlier. In 1999, Rwanda officially opened its Mission in New Delhi and appointed its first resident Ambassador in New Delhi in 2001. The country became a full member of the COMESA FTA in 2004 and subsequently, in 2007, it was admitted to the EAC. Rwanda is also a Commonwealth member since 2009. Relation get further strengthen as Rwanda became member of African Regional Economic Communities (RECs). Indian assistance to Rwanda has been guided mainly by the India-Africa Forum Summits. A bilateral air services agreement was signed to enabling direct flights between the two countries. An entrepreneurial development centre in Rwanda is being set up by India. Exemption of visa will be provided for entry of diplomatic and official passport holders. Rwandan government also desire Indian pharmaceutical companies in Rwanda. Indian government asked about President ‘Paul Kagame’s governance model’ that helped Rwanda becomes one of the cleanest and well-run states in Africa. India also offered scholarships and fellowships to Rwandan students to pursue undergraduate, masters, and research courses in India. India-Rwanda Innovation Growth Program is being launched. It will expand ties in Science, Technology and Innovation. Under the Programme, 20 demonstrated and validated Indian technologies and innovations are expected to be adopted over a period of two years. The joint ventures created with Rwandan partners can deliver many sustainable social enterprises that will stimulate economic development in Rwanda.